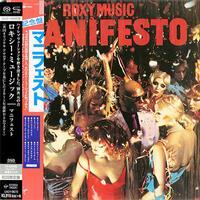 Manifesto is the sixth studio album by Roxy Music, and was released in 1979 by E.G. in the U.K., Polydor in Europe and by Atco Records in the U.S.. Following an almost four-year recording hiatus, Manifesto was Roxy Music's first studio album since 1975's Siren. The first single from Manifesto was "Trash." which made the U.K. top 40. However, the second single, the disco-tinged "Dance Away," returned the band to the top 3. It became one of the band's biggest hits and was also the 9th best-selling single in the U.K. in 1979. The third single from the album was a re-recorded version of "Angel Eyes," which was far more electronic and "disco" in nature than the power-pop album version. The single also made the U.K. Top 5 in August. The album itself peaked at No. 7 in the U.K. The cover design which featured a variety of mannequins (a concept also used for the covers of the singles from the album), was created by Bryan Ferry with fashion designer Antony Price among others.